I’ve been to Japan twice so far: once in high school on an exchange program, and once in my twenties to tour with a friend. I returned from my trips with an absolute love of Japanese food. Tea ceremonies, sushi, sukiyaki, fast food, vending-machine treats: I tried everything that was put in front of me. Sure, I didn’t like 100% of it, but it was a near thing. I would eat a heck of a lot more Japanese food back here in Canada if it weren’t so expensive — and if a greater variety of dishes would cross the Pacific. 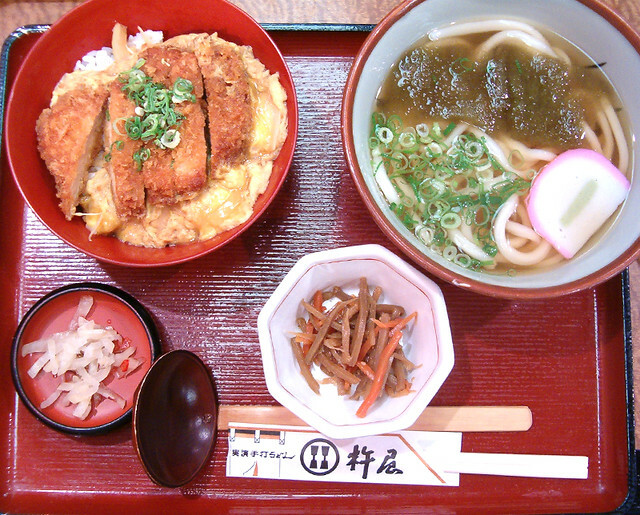 Lunch at a restaurant in Kyoto, Japan: torikatsu (breaded & deep-fried chicken cutlet) or tonkatsu (the same thing, but made with pork cutlet instead) on egg and rice; a bowl of udon soup with seaweed, green onions and kamaboko (fish cake); and two types of pickles. One of my favourite things about eating in Japan was all of the different types of noodle dishes. My horizons really expanded from the macaroni, spaghetti, and lasagna were more that I was familiar with. In Japan, they fried their noodles, they put them in hot and cold soup, they served them with every kind of topping they could think of. 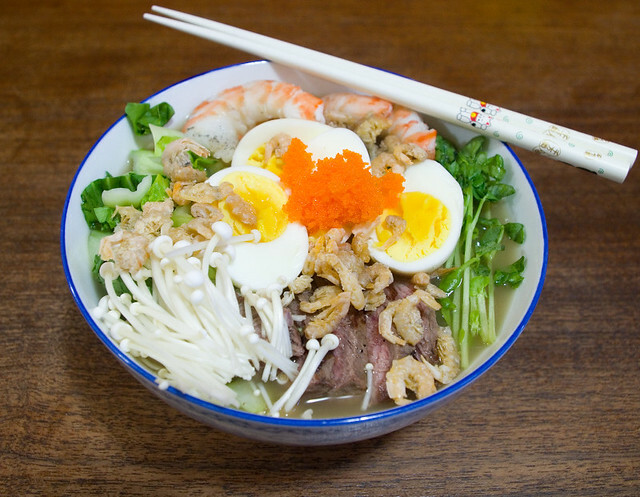 Of course, now there is a lot more variety in how people use noodles in Canada; there’s a Vietnamese pho restaurant in every neighborhood, ramen is making inroads into the culinary scene, and udon is on the menu at most Asian fusion restaurants. 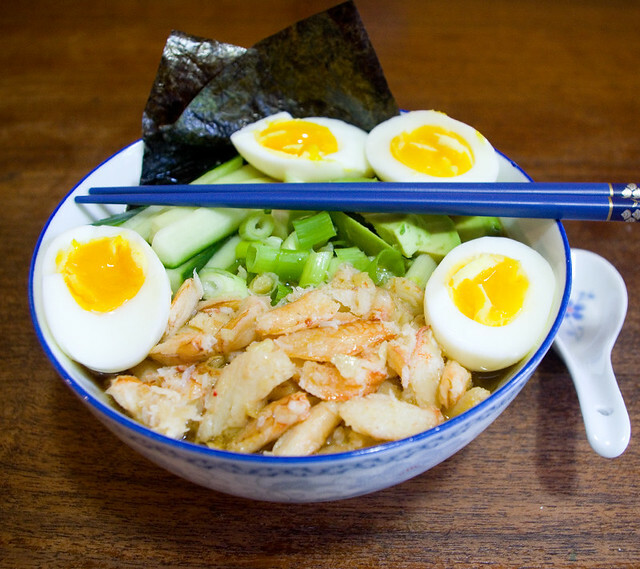 Not to mention that you can finally get Asian noodles that aren’t instant ramen at most grocery stores. But before I went to Japan the first time, pasta that wasn’t wheat-based and served Italian- or Italian-American style was rare around here. 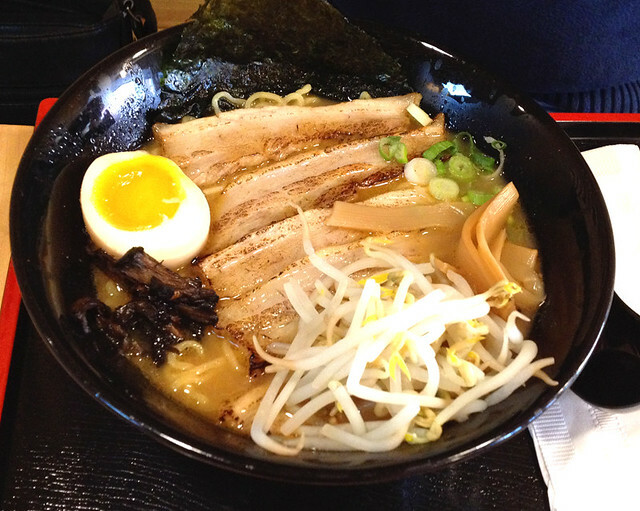 Hakata tonkotsu ramen (pork belly, shiitake mushroom, bamboo shoot, scallion, nori, soft-boiled egg, pork broth, ramen noodles) from Ottawa restaurant Ginza. Seriously the best ramen I have had outside of Japan. Now I make my own noodle soup. It’s Japanese-inspired, but it’s definitely not authentic. I mean, I sometimes use turkey broth, and turkey is a meat that just isn’t used in Japan. I use locally-grown produce and meat when I can, but I also include imported spices, sauces, and canned/preserved goods when I have the opportunity. Asian fusion is the best description I can come up with, although it sounds kind of pretentious for my style of cooking. Hodgepodge, perhaps? Prepping for noodle soup at my house. 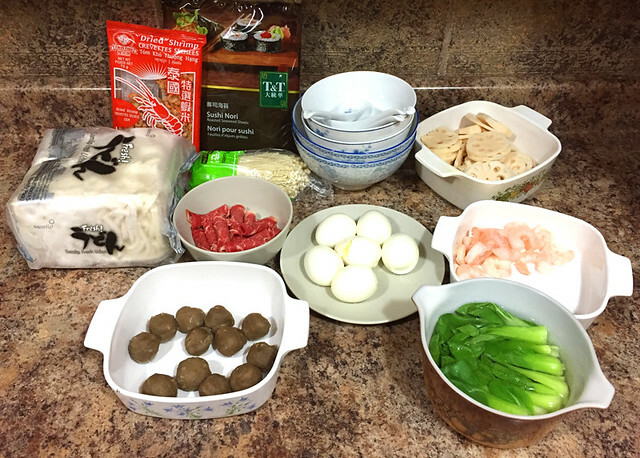 Items include frozen udon noodles, dried shrimp, sushi nori, enoki mushrooms, parboiled lotus root, thinly-sliced beef (pour boiling broth on this to cook), soft-boiled eggs, shrimp, beef balls, and baby bok choy. All ingredients have been precooked as necessary. 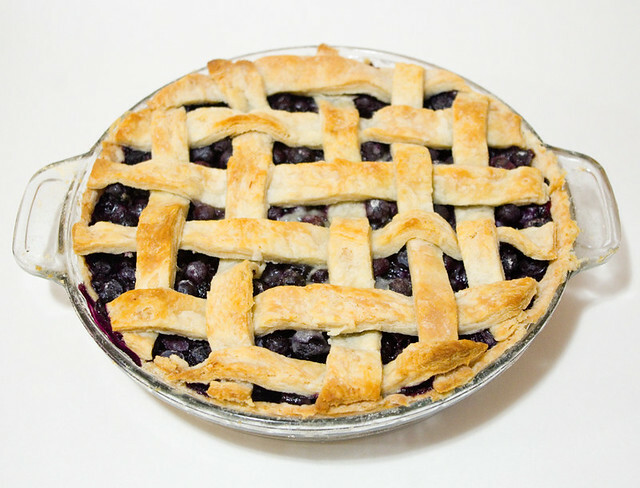 I don’t so much have a recipe as I have a process. First, I make the broth. Sure, I could use commercially-made broth, but I like to make my own from the bones saved from meat I’ve previously prepared. I store bones in the freezer until I have enough, then I put them (and sometimes cloves of garlic and/or dried mushrooms) in the crock pot. I fill the pot the rest of the way with water, and then I let it simmer for two days, replenishing the water as it goes down. Then I strain out all the solids, then refrigerate the broth so I can skim the fat off of the top. Of course, this makes much more broth than I can use at one sitting, but it freezes well, which means I don’t have to make the broth from scratch every time. Immediately before using the broth, I will season it with a dash of soy sauce and a tiny bit of instant dashi, although since that stuff goes really far, I don’t need much! 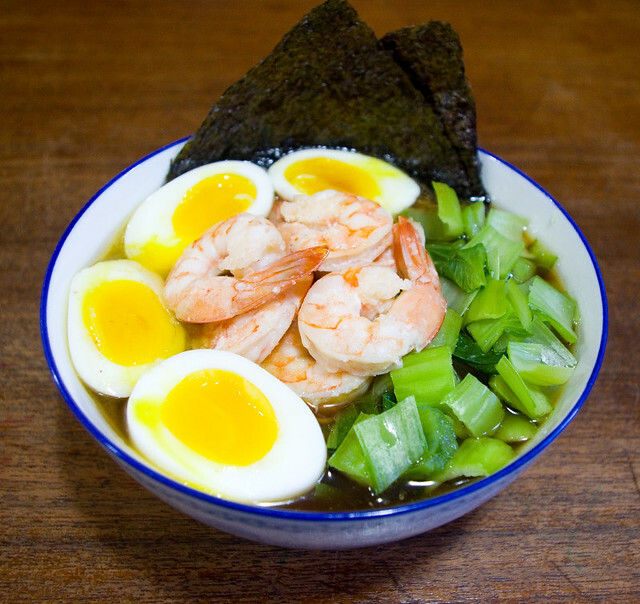 I can use the unseasoned broth for a greater variety of dishes, so I only season as much broth as I plan to use that day. Right before eating home-made udon. Thing 1 just couldn’t wait to sit down and dig in. The bowls on the left are smaller for the kids, and a lower noodle to broth ratio. Then I prepare all of my toppings. I will throw almost anything into a bowl of noodle soup, so long as it’s the kind of thing that stands up well to being boiled. Most vegetables go well, as do most meats. Fruits and squash are generally too fragile. Cleaning out the fridge of leftovers is perfectly fine, since the toppings have to be precooked anyway, and will be warmed up by pouring broth over them. Once I have all of my toppings cooked (I do a lot of it in the microwave, but in warmer seasons using the barbecue adds a lovely flavour), I bring my broth back up to a boil and separately I cook up the noodles accoring to package directions. I prefer frozen udon, but it can be any kind of long Asian noodle, really. 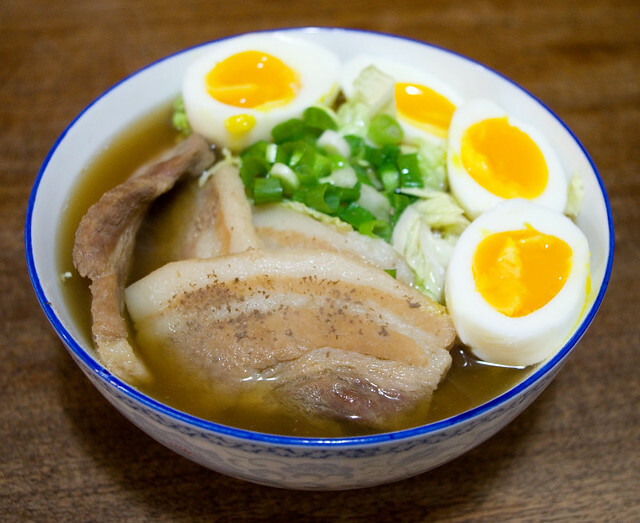 Ramen or vermicelli are great too. Then into each bowl I put a base layer of noodles, then the toppings, and then I pour the broth over top. Last but not least I like to add a square of sushi nori when I have it — this has to be done last minute because it wilts so fast. 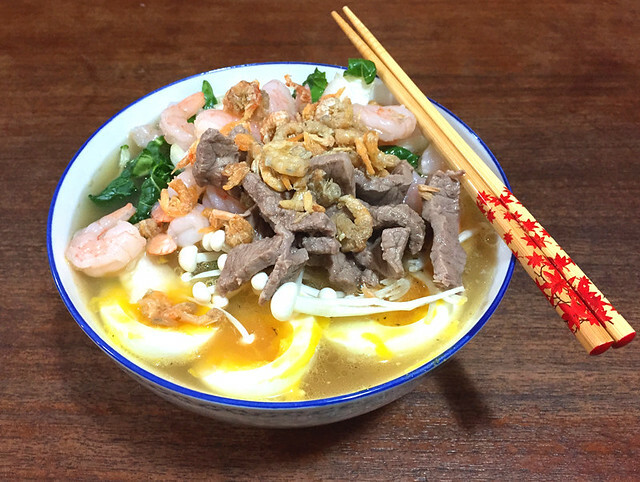 Here are some examples of noodle soups that I have cooked over the years. 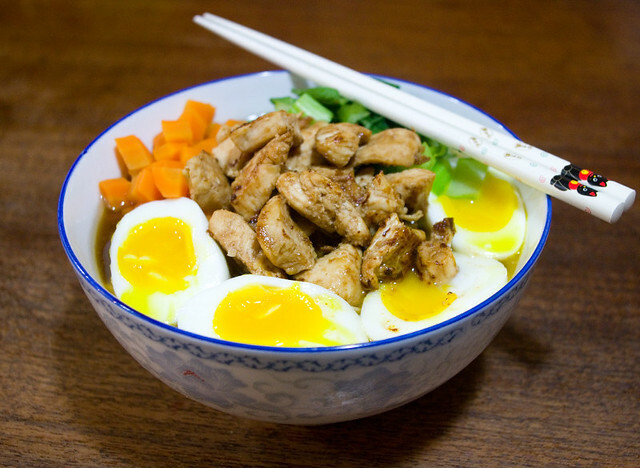 If this inspires you to try to make a noodle soup yourself, do let me know — and show me a photo! 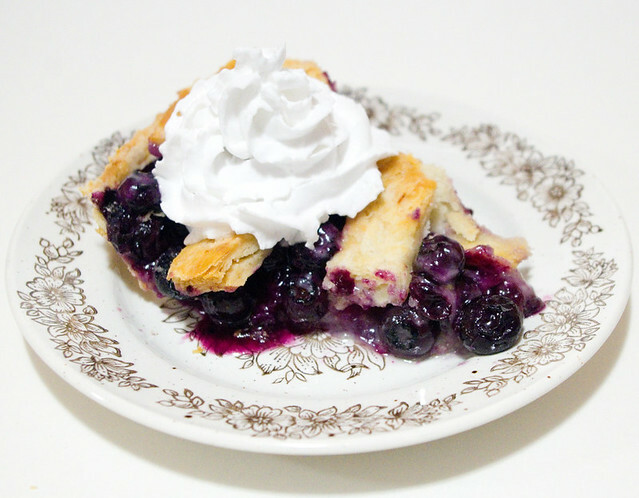 I love seeing what other people do with my recipes and tutorials. 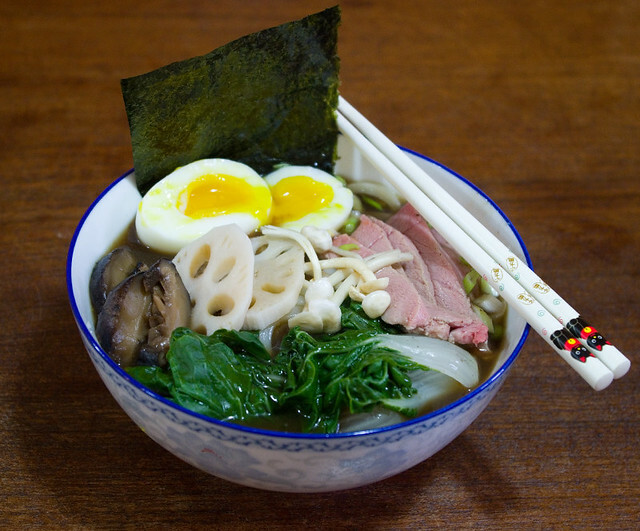 Udon soup with beef broth, nori, soft-boiled eggs, green onions, rare beef, enoki mushrooms, lotus root, shiitake mushrooms, and baby bok choy. 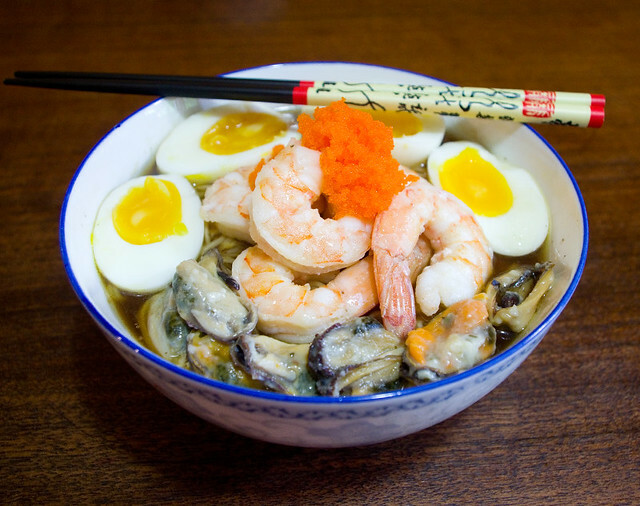 Udon soup with chicken broth, nori, shrimp, dried shrimp, soft-boiled eggs, enoki mushrooms and baby bok choy. 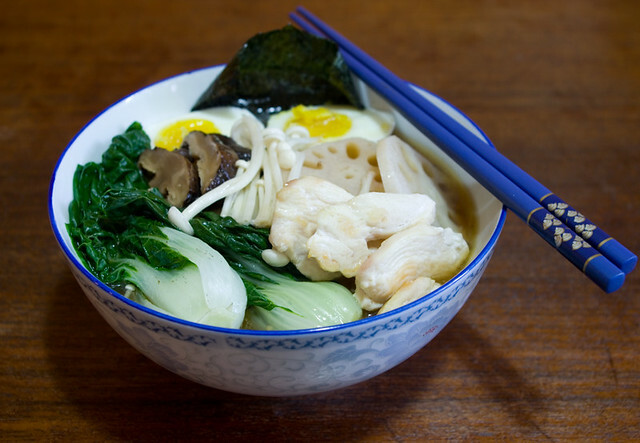 Udon soup with chicken broth, nori, soft-boiled eggs, lotus root, enoki mushrooms, shiitake mushrooms, chicken, and baby bok choy. 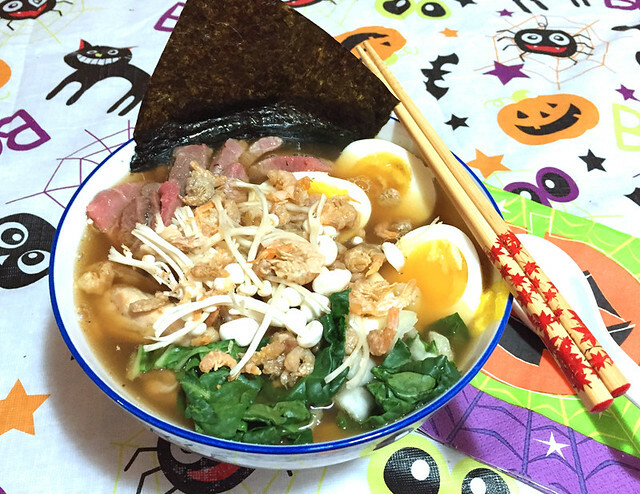 Udon soup with beef broth, hard boiled eggs, dried shrimp, enoki mushrooms, chicken, and baby bok choy. 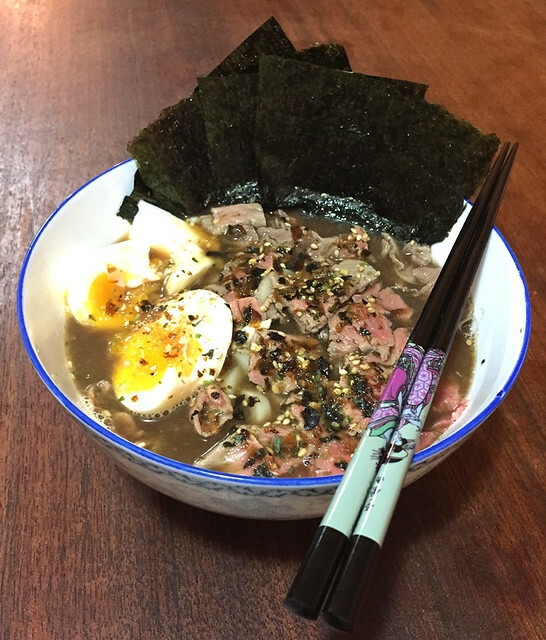 Udon soup with pork broth, nori, rare beef, soft-boiled eggs and furikake. 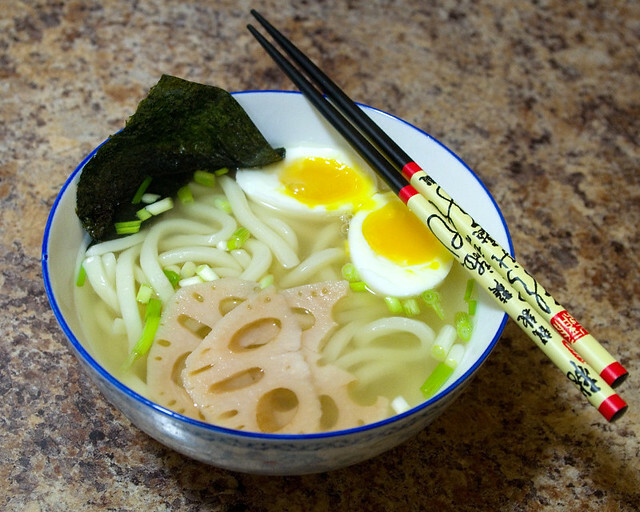 Late-night-snack udon soup with chicken broth, nori, soft-boiled eggs, lotus root, and green onions. 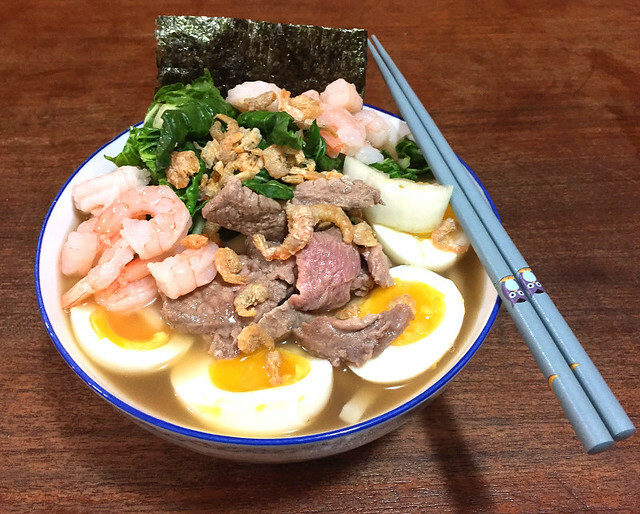 Udon soup with turkey broth, nori, baby bok choy, shrimp, dried shrimp, soft-boiled eggs, and medium-rare beef. 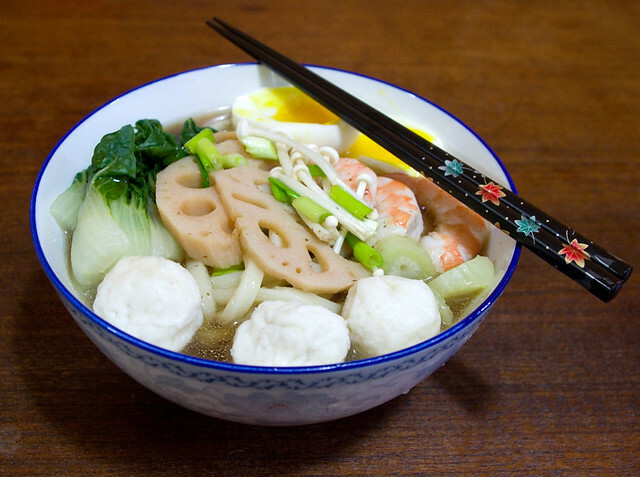 Udon soup with pork broth, soft-boiled eggs, lotus root, green onions, enoki mushrooms, shrimp, celery, and chicken balls. 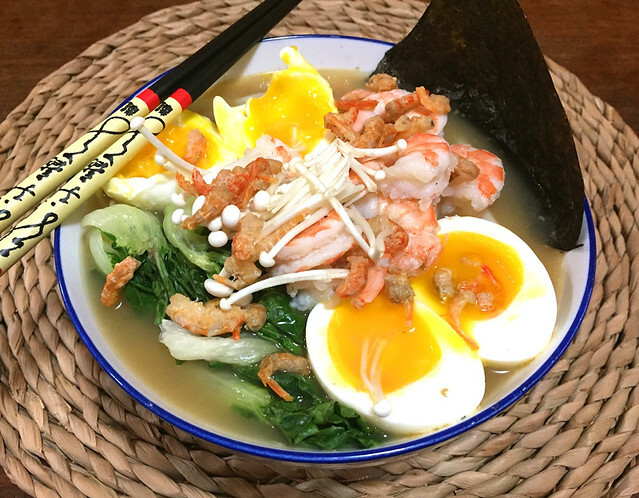 Udon soup with pork broth, baby bok choy, shrimp, dried shrimp, well-done beef, enoki mushrooms and soft-boiled eggs. 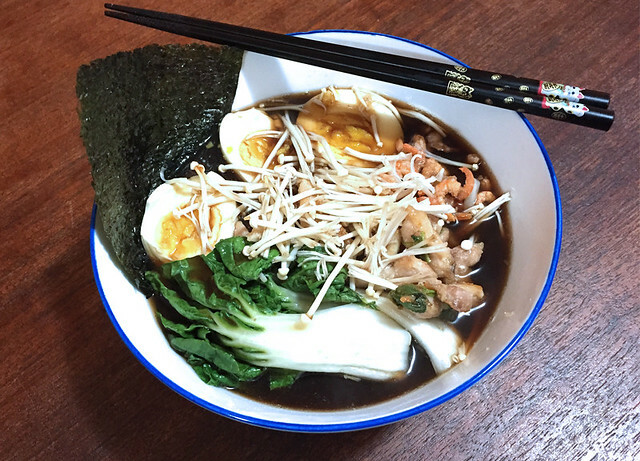 Udon soup with turkey broth, nori, rare beef, soft-boiled eggs, dried shrimp, turkey, enoki mushrooms, and baby bok choy. 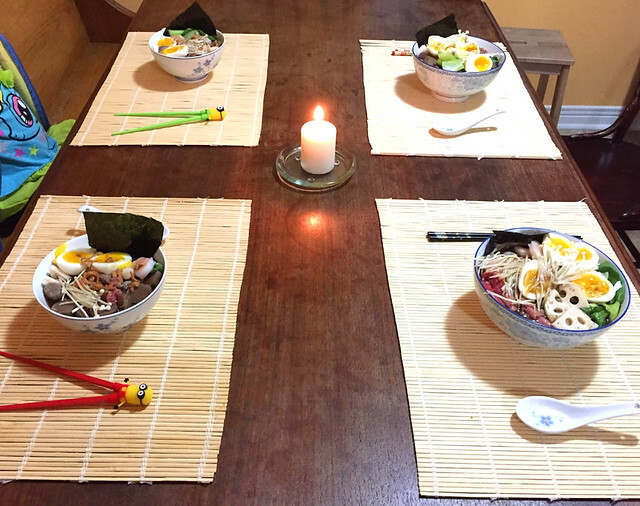 Udon soup with turkey broth, barbecued tiger shrimp, baby bok choy, hard boiled eggs, masago (seasoned capelin caviar), dried shrimp, pea shoots, enoki mushrooms, and barbecued beef steak.